It's all about the batter, the butter, and even the pronunciation of the word "scone." Andrea Geary lived in Scotland for eight years, so it made sense that she was tasked to develop the Cook's Illustrated recipe for British-style scones. Here, she talks to us about the differences between American and British scones, what you should slather on top of the pastries, and why no matter how you pronounce “scone,” someone in Britain will think you’re pretentious. Why develop a specifically British scone? British scones are very different from the American scones you’ll find in coffee shops. We’ve done a bunch of scone recipes before, but they’ve all started with this minimal mixing of the fat, which is very much an American biscuit technique. American scones also have a higher ratio of fat-to-flour than British scones do. My first job in restaurants was making baked goods for a cafe; one of the cook’s partners there used to drop her off at work and he used to take a scone every time. He was Irish, and he would say, “This is really good—I really like this—but this is not a scone.” If you’re from the U.K., our American versions just aren’t the real deal. What’s the biggest difference between British and American scones? It’s really about the butter. When I lived in Scotland it became clear that a true British scone is not as buttery. Not because the Brits are nutritious, but because in Britain you don’t put a lot of butter in because you slather butter on it when you eat it! By the same token, you don’t put a lot of sugar in it but you pile jam on top. They’re probably equally injurious to one’s diet but in different, equally lovely ways. What about add-ins? Do Brits mix dried fruits, nuts, and chocolates in the batter as Americans tend to? It’s interesting to compare a British scone to a Martha Stewart or Ina Garten one, which are really good but on the opposite end of the spectrum as far as add-ins and butter go. Ina Garten’s recipe has three times as much butter as our British scone recipe does. And British scones would very rarely have fancy add-ins; they might have currants or raisins, but that’s about it. And many people feel that even that mucks it up, that you really want them plain. One of my friends in Scotland who reads Cook’s Illustrated saw this recipe and laughed because he has this thing about currants in his scone. He thinks it’s disgusting. And the pronunciation is another thing: Half the people say “scone” and half say “scawn” and no matter which way you say it, half the people in the room think you’re being pretentious. There’s no way to win. You started developing these scones by trying out existing recipes. Which ones did you like? I tried a Dan Lepard recipe. He’s a British baker and he’s well known; he writes for The Guardian. That was interesting because it had yogurt and cream and didn’t have any eggs. I made a recipe that I used to make when I worked at a posh hotel on the Isle of Skye called Kinloch Lodge that’s run by Lord and Lady MacDonald; she’s a very well-known food writer in the UK. And Kinloch Lodge is well known for their food—they now have a Michelin star. That was a really interesting recipe in that it had 3 pounds of self-raising flour and only 2 ounces of fat, which was vegetable oil. It’s an incredibly low-fat scone. We used to make that for breakfast, and it had an interesting texture. And then I made one by Paul Hollywood who presents a TV show called “The Great British Bake Off” and one by the National Trust, which runs all the historic sites in Britain—the castles and everything. Every castle has a cafe, and this is recipe they serve in them. The fat was half butter and half lard and it had quite a dry dough. What did you learn from trying these recipes? What I took away from the Kinloch Lodge one was that using vegetable oil means you don’t run the risk of having those chunks of butter in the batter like you do in an American scone. I consulted YouTube and watched videos of people’s grandmothers making scones, and they started with soft fat. I knew I didn’t want to use vegetable oil, but I did want to use a softened fat so I could work it in completely, as it makes the scones a lot more tender and cakey rather than layered and biscuity. So we use softened, not melted, butter. You can work it in by hand, but it’s faster to do it in a food processor. Which of these is the final recipe closest to? I’d say it’s kind of a mash-up of the National Trust scone and the Kinloch Lodge scone. I knew that I didn’t want to go with vegetable oil from the Kinloch recipe and I didn’t want lard, either; I wanted to use only butter. And I wanted them a bit less dry, so I added milk. Neither of those had fruit in them, and I ended up putting currants in because we wanted these to be the ultimate British scone, and currants seemed very British. I ended up baking them pretty hot, starting them in a hot oven and turning it down, which gave us the best lift. 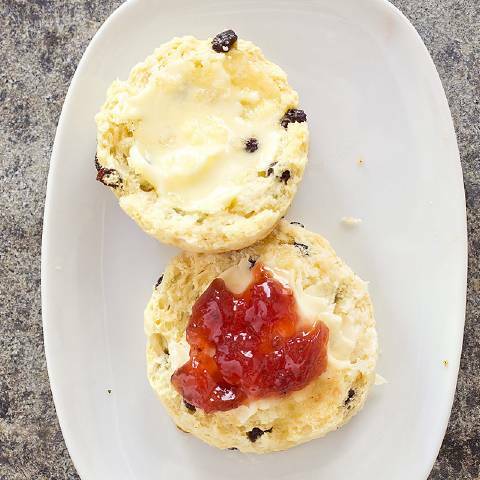 What’s your favorite topping to put on these British scones? I went to the farmers' market last summer and scored some gooseberries, which you don’t see that much. I love these with gooseberry jam. Oh, and butter: First you’ve got to spread on some salted butter. So, yes—salted butter to spread, and gooseberry jam, because that makes it especially British. But if all else fails, strawberry preserves are classic. 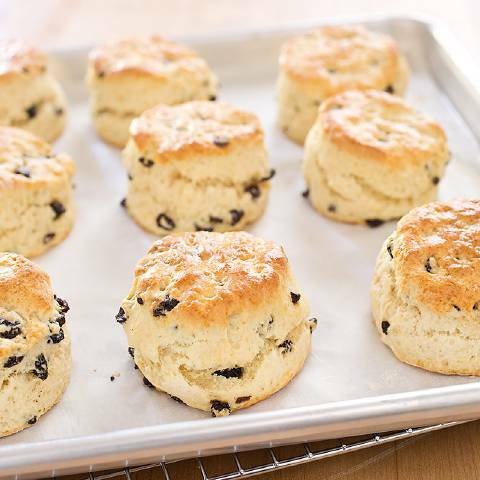 Inspired to make Andrea's tender British-style scones? In this recipe we add more than the usual amount of leavening (2 teaspoons of baking powder per cup of flour) to make the lightest, fluffiest scones, and add currants for tiny bursts of fruit flavor. Properly balancing sweet and tart makes the difference in a winning preserve. Favorite Collections let you organize your favorite ATK content. Are you building a menu for an upcoming birthday dinner? 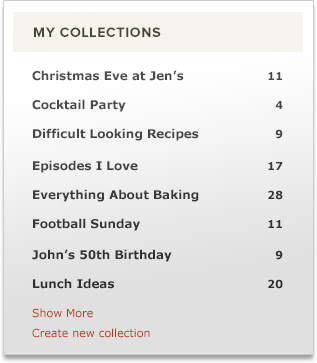 You can keep those recipes in a collection called "John’s 50th Birthday," for example. Your collections can include more than just recipes, too. Add how-to articles, videos clips or equipment reviews into the same collection. Create your first collection below to get started. No thanks, I’ll create a Collection later. Are you sure you want to delete this Favorite? You can add this item back to your Favorites and your Collections at any time.